We've got springtime on our mind even though it's been quite chilly in NYC this week, so today's pick is After Six's Style 6600, a matte satin cocktail dress in a classically cut style. Shown in Nantucket print, this dress has a trendy skinny belt with a round buckle, and hidden side pockets in a full skirt. It's getting hard to remember that pockets only recently made a comeback because they now feel like a necessity! 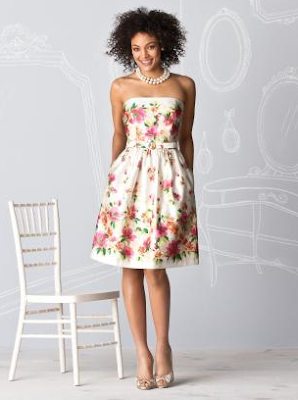 Put on a necklace and some slingbacks like this model, and you're ready to go to a day wedding, a bridal shower, or that fancy corporate summer picnic where you have to hobnob with upper management. This dress is also available in all of Dessy's matte satin color options and Dessy's Cape Cod, Melrose and Palm Beach prints. Nothing like floral prints to get us in the mood for warm weather!